After taking a few weeks at the end of 2018 to relax and sort out a few personal things I have been back in training since early January. I have asked my new fitness trainer, Martijn van Oosterhout of Golf Athletic, to make me work really hard and I am now getting back to my best fighting weight. I have also been giving some attention to my biomechanics with the help of Mikel Vos as well as working with my regular swing coach, Roel. I am happy with the way my preparations are going although the weather in the last few weeks have not been great for golf so it’s been almost all simulator work. The Challenge Tour 2019 only begins in April so I have put my name down for 3 European Tour tournaments in March, Oman, Qatar and Kenya. With playing category 20 I am not sure to get in but it will be good practice for me if I do. And better weather than in the Netherlands! Follow my progress this year here or on social media. And roll on Spring! 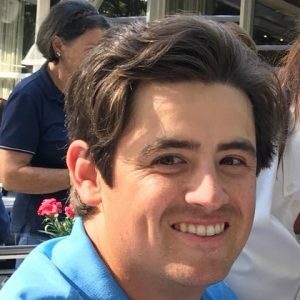 I was born in 1989 (in Leidschendam, Netherlands) and started to play golf when I was 11 years old. My father played golf and gave me a lot of encouragement but before long I started to play better than him so he decided to stop. I had a successful junior and amateur career, which included a lot of individual success, as well as playing for the Netherlands and for Europe in some of the most prestigious amateur team events. But I also wanted to concentrate on finishing my formal education. In 2013 I got my Bachelor’s degree in Economics and Sports Marketing from the Johan Cruyff Institute in Amsterdam, before playing one more year as an amateur. I ended 2014 in the top 40 of the World Amateur Rankings and decided to turn pro, so I entered the Q-School of the Alps Tour, one of the 3rd tier European Satellite Tours. I came second overall and my pro career had begun. Can I help you achieve your business objectives by promoting your company, brand or product? You could position your company name, logo and/or brands prominently on my clothing or golf-bag, we can arrange golf clinics of golfing days for you and your business guests or I could participate in one or more of your corporate events. And you can also help me achieve my professional objectives for this year and beyond. You can follow my progress this season on any of my Social Media pages using the links below. You can also use the email or Whatsapp link to get in touch with my support team. Don’t hesitate to contact me.